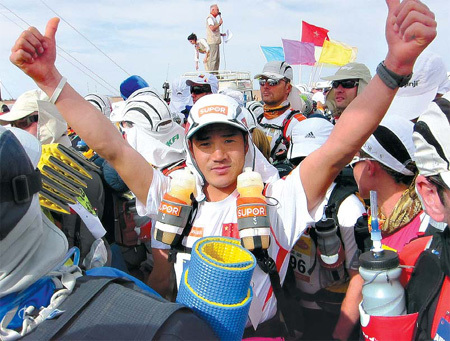 SHANGHAI - Recalling his recent participation in the grueling 26th Sultan Marathon Des Sables, a six-day, 243-kilometer endurance race across the Sahara Desert in Morocco, Chen Penbin sounds a bit disappointed. Despite the fact that the 33-year-old is the first person from the Chinese mainland to have participated in and finished the desert marathon, Chen was unhappy with his performance. "I was glad that I completed the race - it felt like a journey through hell, to be honest - but I could have done much better," he said. Chen finished 56th among the 849 competitors who participated in the race, which took place from April 3 to 9 this year. It is mainly amateurs looking to challenge themselves who participate in outdoor endurance events like the Sultan Marathon Des Sables. But few Chinese people took part in such events until recently, partly because of the high costs involved - Chen's registration fee for the Sultan Marathon Des Sables, for example, was around 26,000 yuan (US$3,900). Born and growing up in a small fishing village on an island in East China's Zhejiang province, Chen is by no means a wealthy man, but he has always been interested in sports. He has been swimming since the age of 6, and was the fastest among his peers in the village. Chen recalled that he first became interested in endurance sports after his first trip carrying water from the mountain near his village. "I still remember the day as more like a festival. My father made a pair of small barrels for me and I joined a dozen other villagers for the trip," Chen said. "On our way back, many were singing and joking. Parents even held a competition for us children on the small path in the mountain to see who could run the fastest while carrying the most water." In 2000, he participated in his first formal competition, a push-up contest held in his hometown. Chen beat all the other competitors, including several well-trained professionals, with 438 push-ups in succession. Cheered and encouraged by local villagers, Chen continued to participate in and win a number of endurance sports competitions, such as water-carrying and the triathlon, first in his home province, then across the country. But he had to forego a number of influential competitions due to lack of money - he relied on his uncle to pay his travel costs and registration fees for the events. His father was strongly against him competing. "My father thought I'd never be able to make a living by participating in these various sports events," Chen said. "He hoped I would return home to continue fishing or find other jobs in the cities and make a real living." But Chen was not to be deterred. He secured long-term sponsorship in 2004 from Supor, a Zhengjiang-based kitchen appliance manufacturing company. The company promised to give him a position as a bodyguard and full sponsorship for each event he participated in, plus an annual training subsidy of 10,000 yuan. With this support, Chen was able to participate in a number of world outdoor endurance events. However, as he has few predecessors, Chen has had to rely on himself to devise a training regime. Each day he runs at least 42 km, sometimes carrying a pack of 5 kilograms. He has also made himself a number of training facilities to build his muscles and develop his strength. However, due to lack of experience, Chen said it is difficult to get properly prepared for the events, especially for the international competitions. Chen said the first time he joined the Marathon around the Alps in France in 2009, although he finished 27th, which was not bad for a first-time competitor, he also damaged both knees. "I knew nothing about the Alps, my knees were frost-bitten," Chen said. He thought he had prepared properly for the marathon in Morocco, but it turned out that he had greatly underestimated the dryness in the desert and prepared the wrong food, which included mostly hard-to-digest dried beef instead of the high-calorie chocolate most of the experienced competitors were eating. Chen said he intends to participate in the marathon in Morocco again next year because he believes he can at least finish in the top 20. Listed on his schedule for the rest of this year are another five international endurance sports events, including the Antarctic Ice Marathon in November. Chen recalled the first time he participated in an international event in 2009. "Many competitors thought I was Japanese because there had never been a participant from the Chinese mainland before," Chen said. "I hope I can change this through my presence at more international events."